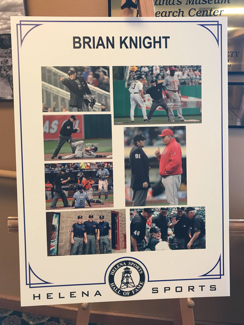 Montana native and MLB Umpire Brian Knight was inducted into the Helena Sports Hall of Fame during the All-Star Break, becoming the first big league umpire in the HSHOF. Brian Knight is inducted into Helena's HOF. 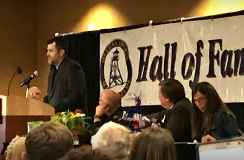 Knight, nicknamed "BK," presently resides in Lincoln, California and flew home to Montana for the induction ceremony and banquet, which took place Thursday night at Helena's Great Northern Best Western convention center. In a previous interview with Skylar Browning and Jeremy Watterson for their 2015 book, Montana Baseball History, Knight credited his father, Jim Knight, with introducing him to the craft, explaining, "My father went to umpiring school in 1981 and, over the years, he'd always connected more to the umpires. I remember from the time I was six years old being surrounded by them, like the Pioneer League guys when they would travel through town...I'd hear their stories around the kitchen table, get to know them pretty well. Some of them would come to my birthday parties." After graduating from Capital High School in Helena, BK attended William Jewel College in Missouri, before a heart-to-heart with father Jim persuaded Knight to sign up for the Brinkman-Froemming Umpire School in 1995. His first pro job after graduation was in the very same Pioneer League he grew up with, after which he worked the Midwest, Florida State, Southern, and Pacific Coast Leagues, before his promotion to the MLB staff prior to the 2011 season. HSHOF display for inductee Brian Knight. A message in perseverance, Knight made it to Triple-A in 2000, but was stuck at that level and as a call-up umpire through the 2010 season, due, in part, to the 1999 shakeup at the AL, NL, and MLB offices and hiring fall-out that resulted from the merging staffs and various litigation outcomes. In order to make ends meet during his extended minor league career where umpires aren't paid all that much, Knight delivered flowers and worked at the MacKenzie River Pizza Company. After his 2001 MLB debut, Knight officiated the 2012 All-Star Game, 2013 Wild Card Game, and 2014-16 Division Series. He also staffed the 2006 and 2013 World Baseball Classic tournaments. Following expanded Replay Review's first season (2014), Knight said he missed about four calls out of a possible 500 chances. That would reflect a 99.2% accuracy rate. Knight also shed some light on his recent absence (May 15 - June 11, and June 14 - Present) from the Major League scene, explaining to the local Independent Record, "I actually haven’t worked for nearly a month due to a severe neck injury...I'm waiting to hear from my doctor." Knight has a history of plate-related injuries. Knight continued by illustrating the physical toll that professional umpiring has taken on his upper body: "The repetitive jarring from foul tips, and sometimes even a bat, adds up to cumulative concussions...And that work behind the plate, crouching up and down for 3 ½ hours, is hard on your back. I’m only 42, and the doc said my X-rays show the neck of a 70-year-old man." 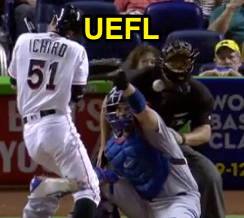 In September 2016, Knight left a game in Miami after a deflected hit-by-pitch struck the lower right chin portion of his facemask after first hitting batter Ichiro Suzuki's right shoulder. In April 2015, he exited a Phillies-Nationals game in the top of the 9th inning after catcher Jose Lobaton was unable to catch a 95.6-mph fastball from pitcher Blake Treinen.